Exotic botanicals are unusually elegant. A variety of succulent plants is presented in a dark mahogany wood trough for an eco-chic potager. 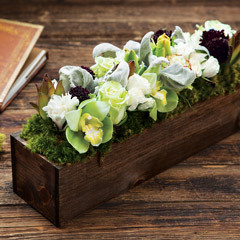 Resilient and easy to care for, the Giselle Succulent Trough is great for home, patio or office. Measures approximately 19” x 4” x 7” and requires 2nd day shipping. 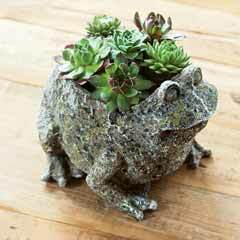 - The Giselle Succulent Trough is an easy to care for arrangement of potted succulent plants. 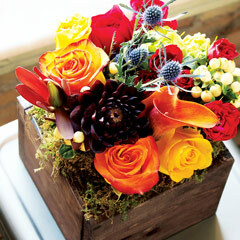 - To care for these plants, remove each individual pot from their wooden presentation box and place in the sink. Water thoroughly and allow each to drain completely before returning the plants to their presentation box. To tell if your plants need to be watered, gently pinch a leaf on each plant. Leaves should feel firm and full of water, like a grape. If leaves do not feel firm, give your plants a thorough watering. - Your Giselle Succulent Trough will thrive in almost any setting from shade to full sun. However, it should be kept out of extreme hot or cold temperatures. - The succulent plants in your Giselle Succulent Trough should be kept in their plastic pots and wooden crate. We do not recommend re-planting. Giselle Succulent Trough is rated 4.7 out of 5 by 30. Rated 5 out of 5 by Cookie I from Easy ordering process Ordering the "Giselle Succulent Trough" was a very easy process!! My gift recipient was very happy with her gift! It arrived in perfect condition...no broken leaves,etc.Gift was ordered as a bereavement acknowledgement. Rated 5 out of 5 by Kimmidallas from Beautiful succulent design options! I bought this beautiful succulent about a month ago, and it is thriving. I love it so much I'm about to order another one for myself. I am in love with Olive and Cocoa. I stumbled onto this company and now it is my go-to for gifts and unique home design items!! Rated 5 out of 5 by BizGifter from Rave Reviews from Our Clients We send these arrangements as welcome gifts to our clients. They are a hit and we have received countless compliments on them. 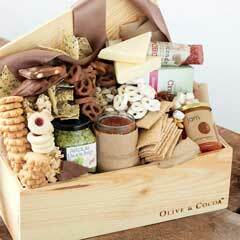 Our clients love to receive them and they do making a lasting impressions. Rated 5 out of 5 by Gater1000 from More beautiful than the pictures..... My wife is a big fan of Olive & Cocoa and I wanted to get her a floral item that wouldn't just fade away. The Giselle Succulent was perfect for a 44 year anniversary and she loves it. It will be with us for years before the plants will need to be re-planted to larger containers. Thanks so much. Rated 5 out of 5 by MsTL from More Beautiful Than Pictured I received this gift several weeks ago and just adore it! The one I received is much more beautiful than the one pictured - it has a unique array of expertly arranged succulents that are all healthy and in their prime. I know I'll be enjoying it for months to come and will certainly consider it a great gifting option for future occasions. Rated 5 out of 5 by Mglockye from Beautiful! Beautiful succulents. I received a phone call making sure my package was delivered/received. Plants in great condition and wonderful customer service. Rated 2 out of 5 by basil44 from No Variety I just sent this to my mom for her birthday and while the plants are beautiful they are all the same except for one, absolutely no variety like the picture depicts. They were all the spiky ones and I had read another review that stated this but hoped it was just a fluke. The whole point of ordering something like this is for the variety. Disappointed, not feeling like I got my money's worth, will not be ordering from them again.